Pamporovo and Chepelare expect a 20 % increase in the number of tourists from Russia, considering the number of charter flights from Moscow to Plovdiv, announced the executive director of Plovdiv Airport Doichin Angelov. According to him the majority of flights to Plovdiv will be executed during the New year and Christmas holidays. The charter flights to Plovdiv this year will come from Dublin, Belfast and Moscow. 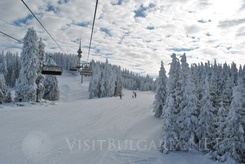 The good forecast for the forthcoming ski season in s the increase in the number of individual tourists landing at Plovdiv from London and Frankfurt.